Book Worm and More: Chicken Soup for the Soul: From Lemons to Lemonade Giveaway - 3 Winners!!! Chicken Soup for the Soul: From Lemons to Lemonade Giveaway - 3 Winners!!! Do you love Chicken Soup for the Soul books? Well, I do!! 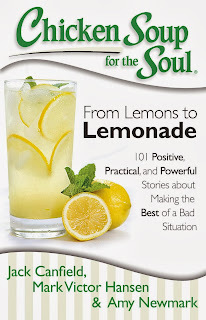 So, I am so excited that I get to give away 3 free copies of Chicken Soup for the Soul: From Lemons to Lemonade: 101 Positive, Practical, and Powerful Stories about Making the Best of a Bad Situation. You can check out my review here.